A heart-breaking, heart-lifting, effortlessly enjoyable story about love and grief and everything in between. Joe lives-despite himself. Driven by the need to atone for the neglect of a single tragic summer’s night, he works at nothing jobs and, in his spare time, trains his body and mind to conquer the hostile environment that took his love and smashed up his future. So when a breathless girl turns up on the doorstep, why does he let her in? Isn’t he done with love and hope? On the other side of the city, graphic designer Elise is watching her marriage bleed out. She retreats to the only place that holds any meaning for her-the tiger enclosure at the zoo-where, for reasons she barely understands, she starts to sketch the beautiful killers. 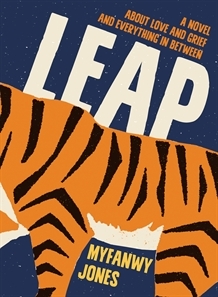 Leap is a beautiful urban fairytale about human and animal nature, and the transformative power of grief. While at its heart is a searing absence, this haunting and addictive novel is propelled by an exhilarating life force, and the eternally hopeful promise of redemptive love.